The Providence Bruins returned to action after the All-Star game with a home-and-home series against the Hartford Wolf Pack. In Friday night’s matchup in Providence, the P-Bruins peppered 50 shots on Hartford starter Alexander Georgiev but needed overtime to knock off the Wolf Pack, 2-1. It’s been a busy week for one of the P-Bruins All-Stars. Austin Czarnik got the call from Boston, an opportunity he’s taken full taken advantage of in this most recent stint. In other news this week, Bruins prospect Ryan Donato is off to the Olympics in South Korea. He will join three of the Bruins’ AHL foes on team USA. Czarnik potted both P-Bruins goals in their 2-1 win, including the overtime winner. After the game, he was recalled to Boston. The P-Bruins could’ve used him on Saturday night, only mustering 17 shots on goal and were 0-for-3 on the power play, where Czarnik’s creativity usually excels. There’s no doubting skill and playmaking ability. Despite a team-low nine minutes and seven minutes and seven seconds of ice time in the Bruins’ 4-1 win over the Toronto Maple Leafs, Head Coach Bruce Cassidy had Czarnik out on the power play and was rewarded with an assist on Torey Krug’s important insurance goal. He received about the same amount of ice time in Tuesday’s game against the Detroit Red Wings and again chipped in offensively for the big club. In the third period, he won a race to a loose puck in the offensive zone that set up what would be the game-winner. Czarnik chipped the puck over to his fellow Miami Redhawk, Sean Kuraly, who found Danton Heinen in front for a goal. For a player with Czarnik’s skillset and size, continuing to win puck battles and aggressive forechecking is a good way to hang around at the NHL level. With young talent in the Boston pipeline, this is a huge opportunity for Czarnik to leave a lasting impression on the big club. Although P-Bruins fans would like to have him around for a playoff push, it’s a big moment for the impending restricted free agent. While it’s likely the Bruins re-sign him this summer, this is a chance for Czarnik to prove he can provide more than organizational depth. Czarnik played over 11 minutes in Wednesday’s 6-1 dismantling of the New York Rangers. Again, it was the Miami connection teaming up as Czarnik assisted on Kuraly’s third-period goal and Cassidy had him on the penalty kill late in the game. He will likely still return to the P-Bruins when Noel Acciari and Anders Bjork come off the injured reserve list. However, the AHL All-Star is doing his best to give Boston something to think about. A three-game point streak against the world’s best players doesn’t happen by accident. He stepped into a lineup that’s rolling over the competition right now and contributed immediately. One Bruins prospect yet to make an appearance in a Boston or Providence sweater is in PyeongChang for the 2018 Winter Olympics. Ryan Donato leads Harvard with 21-10-31 in 23 games. Some in the hockey world wonder if Donato will ever see time in Providence once he leaves Harvard. 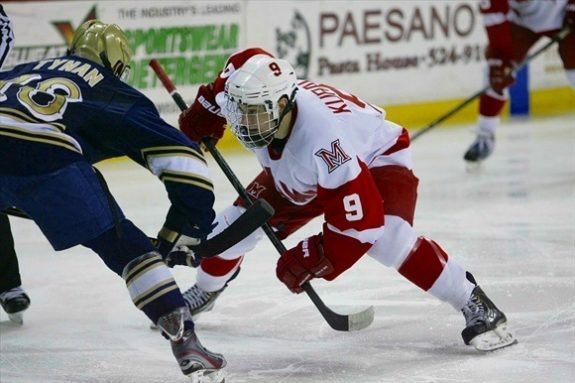 He’s developed into an elite goal scorer at the college level and could follow the fast-track to the NHL, much like his former Crimson teammate Jimmy Vesey. Donato will team up with some familiar AHL faces. Chris Bourque of the Hershey Bears, one of the AHL’s all-time greats, will get the opportunity to represent his country as well. The league will also be represented on team USA by Milwaukee’s Bobby Butler and San Jose’s John McCarthy.